Synopsis : A boat has gone missing. Goods have been stolen. There is blood in the water. It is the twenty-first century and a crew of pirates is terrorizing the San Francisco Bay. Phil is a husband, a father, a struggling radio producer, and the owner of a large condo with a view of the water. But he'd like to be a rebel and a fortune hunter. Gwen is his daughter. She's fourteen. She's a student, a swimmer, and a best friend. But she'd like to be an adventurer and an outlaw. Phil teams up with his young, attractive assistant. They head for the open road, attending a conference to seal a deal. Gwen teams up with a new, fierce friend and some restless souls. They head for the open sea, stealing a boat to hunt for treasure. 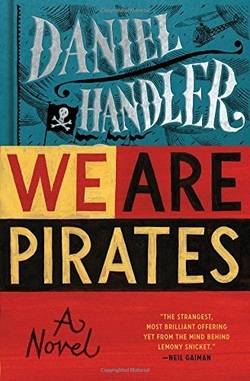 We Are Pirates is a novel about our desperate searches for happiness and freedom, about our wild journeys beyond the boundaries of our ordinary lives. Also, it's about a teenage girl who pulls together a ragtag crew to commit mayhem in the San Francisco Bay, while her hapless father tries to get her home. Daniel Handler is the author of the novels The Basic Eight, Watch Your Mouth, Adverbs, and Why We Broke Up. As Lemony Snicket, he is responsible for many books for children, including the thirteen-volume sequence A Series of Unfortunate Events and the four-book series All The Wrong Questions. He is married to the illustrator Lisa Brown, and lives with her and their son in San Francisco.